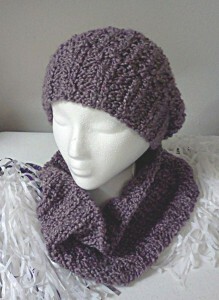 Just finished this great cap and cowl set for my friend Renee. Her favorite color is purple. This is the “Ribby Slouch Hat” by Naomi Adams, and the “Thick and Quick Ribbed Cowl,” both free patterns from the Ruby Knits It website. It’s knit with Lion Brand Homespun, and this great purple color is called Baroque. It’s incredibly soft and just gorgeous, and it only took one skein of yarn to make both pieces. I may have to make a duplicate set for myself!